The extinguishing of fires using carbon dioxide was developed by Kidde engineers over 80 years ago. 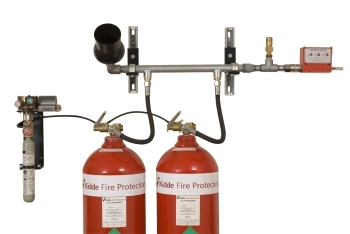 Kidde Fire Protection have been responsible for every important development in this area of fire protection ever since. Accumulated experience gained through thousands of installations in power plants, industrial plants, oil refineries, electronic processes, on ships and in a wide variety of hazardous areas have given Kidde the benefit of plenty of knowledge in this field. The CO2 is stored as liquid, under pressure. The liquid CO2 flows through discharge pipework to specially designed nozzles when a system is activated. The liquid vaporises rapidly during the discharge due to the agent's low boiling point. This results in a penetrative three-dimensional action. Fires that have been burning in even in the most inaccessible areas are not a problem, as the rapid expansion of the gaseous agent allows fires to be targeted in these areas. 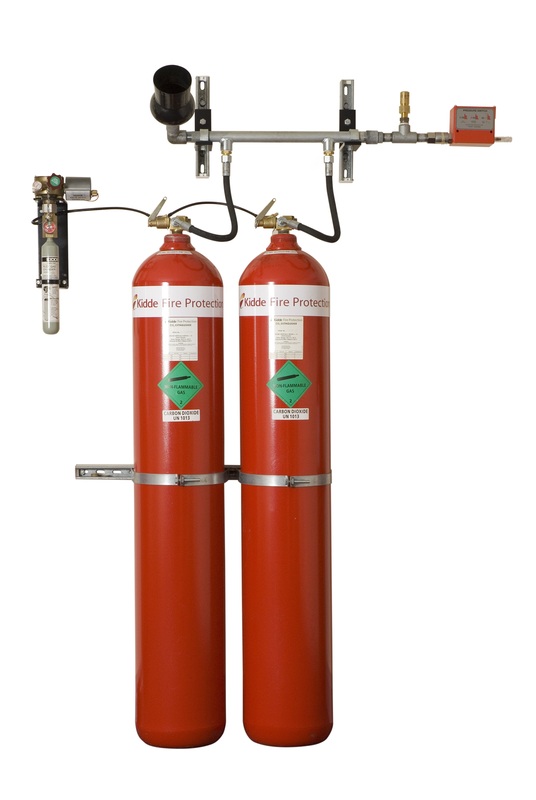 Fire is extinguished by reducing the oxygen level in the risk area to the point where combustion cannot be sustained. The secondary action of this agent is cooling. Cooling is used in local applications where the liquid phase of the discharge is applied directly to the fire and risk materials. 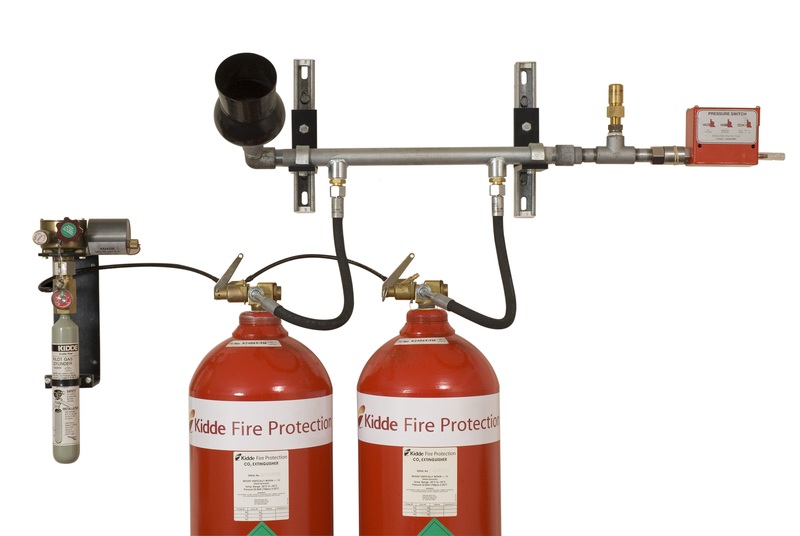 High mass flow rates are achieved as the Kidde Fire Protection High Pressure CO2 system uses large bore cylinder valves. The system reacts within the first few seconds of a fire. This feature can make the difference between a nuisance and a disaster. The fast action of the control system and valve enables this to happen. 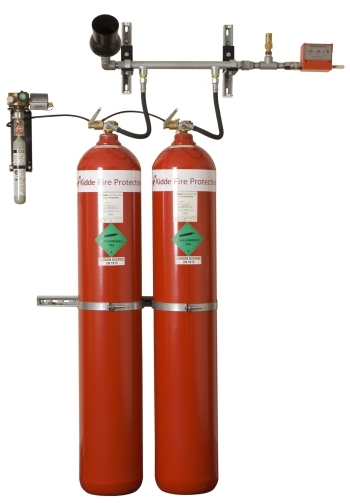 CO2 is one of the most familiar of all gases and is a colourless, odourless, dry, inert gas. Carbon Dioxide vapourises fully leaving no residue after extinguishing a fire. It is non-corrosive and will not contaminate foodstuffs. There is no mess after this product is deployed, there is nothing to clear up and no water damage. Carbon Dioxide can be used on energised electrical equipment as it is also non-conductive. There are many other uses for carbon dioxide, making it a standard commercial product around the world. Due to this, carbon dioxide can be obtained inexpensively, which is an important consideration when frequent recharging of storage containers is necessary. Please note CO2 is not the agent of choice for manned areas due to its toxicity at extinguishing concentrations. Specify drill code when ordering based on results of flow calculations.